The anime is... cute. The protagonist was a little stupid but he was also a super nice kid. Had that, "Altruistic hero that never gives up!" vibe going for him. I've seen it before. It didn't give me anything new but hey, I'm here to watch a Shonen anime. I don't have especially high standards when it comes to a series meant for kids. The world is fun the characters are quirky and the plot is simple enough where I can be brain dead and follow along without exerting much effort. It's meh but a good way to pass time. Then I read the manga. Now I won't watch the anime ever again. It's not an honest adaptation whatsoever. Anime and Manga Seth are NOTHING ALIKE. Yes, they have the same character design and the animation IS itself really good... but manga Seth doesn't smile THAT much. He's actually angry a lot, justifiably so. His motives and pain feels more real to me than anime Seth, who felt more like a "main character" fill in for a new anime series. As of me writing this, the anime is at it's ninth episode and the manga at it's seventeenth chapter. That is NOT enough space between productions to start an anime and it shows. What I thought was just bland writing was actually FILLER. Black Clover was given ridiculous amounts of hate for their few episodes of filler and the Radiant anime has sooooo much more. Chapter six in the manga has our lovable cast all the way over at Rumble Town. Which then follows an amazing, gripping plot that is extremely dark and heartfelt. I was blown away. It deals with heavy-hitting themes like xenophobia, racism, weaponizing and enslaving children. There were also references toward the Salem Witch Trials and The Inquisition. So yeah. I read all seventeen chapters in one sitting and was so devastated with how the beginning of this anime BUTCHERED the beginning of the manga that I refuse to watch anymore of the anime. Episode NINE of the anime finally has Rumble Town REVEALED at least, though they have not yet gone there. Instead the ninth episode was entirely filler to develop Dragunov. Which really doesn't match how Dragunov is portrayed in the manga. I'm assuming of course that he's going to have a character change just like Seth did to make him more generic. Because that's what the anime characters are all written as. Extremely generic tropes meant to draw in viewers. And hey, I'm actually okay with that. You know your audience and you cater to them. Good for you. BUT... the manga is SO MUCH BETTER. Knowing now how amazing, deep, dark, and COMPLEX the manga plot is (after only 17 chapters! ), I'm just appalled at how the anime has treated the original work of the author. I could literally go on for pages about the differences but I'm pretty sure there's some sort of limit here. The anime is painfully "okay" to watch. If I didn't know about the manga I'd still be watching it every few weeks when I had a lot of extra free time with nothing else better to do. It's fun. It can get too quirky to the point of not making sense (I'm looking at YOU coffee-loving Octosquid) but it's not bad at all. Just meh. The animation is actually really good and all of the colors are super bright and pretty to look at. Especially with far away shots of landscapes. But the manga... Oh, I've been wanting to get into a new manga for a long time and THIS is it. This is one of my new favorite manga series for a long time. Seth is just so complex and dynamic as a character that I never want to see anime Seth ever again. I feel like the anime took the manga put a "happy" filter over it. The manga isn't happy. It has it's moments, of course. Seth is hilarious. There are so many mature and witty gags that I could read this manga forever. The anime is like the "kid friendly" version of the manga and gave me bad memories of 4kids back in my childhood. Yeah. I'm making THAT comparison. I don't typically write reviews for anime since I tend to avoid forums and online communities, but I noticed some particularly pointed comments about supposed political propaganda enmeshed in the story line. It seems the episodes involving Rumble Town are the cause of the backlash, but most of the comments I'm seeing that target these episodes seems misguided. The problem seems to me, to be that: The villain (The anti-immigration guy a.k.a. Konrad) seems to be triggering a lot of people that are against illegal immigration, the views and arguments of the villain against immigration are flawed, and that the main character's arguments against the villain are not expressed well. I feel that most of these complaints spawn from a misunderstanding. I'm sure many of you already grasp the difference between legal and illegal immigration already, but for those that do not, allow me to clarify why these complaints hold no grounds. 1. The villain from Rumble Town is against all immigration, not just illegal immigration. He seems to have an irrational hatred towards all those who are not from his neck of the woods; this is downright xenophobia, and is not an attack on Conservative or Republican values (If you claim xenophobia, this is not addressed to you, I just hope you never gain power). This may not be readily apparent to all, but it is clear from his origin story that most of the immigration to Rumble Town occurred before Konrad was in power, but it does explicitly state that the illegal immigrants which entered Rumble Town were imprisoned along with the Defense Force. 2. The anime does a good job addressing the difference between legal and illegal immigration, case in point: the floating city full of sorcerers and humans. This is a city that welcomes newcomers, but requires that they: sign a contract as soon as they enter the city, pay their dues, and obey the laws. The city is filled with all sorts, from humans, to sorcerers, to Kraken-like creatures. (If your issue is due to the current political climate in America, the city even has a wall and a standing army for Christ's sake.) 3. The views and actions expressed by Konrad are what you would expect from a xenophobic tyrant, and the reaction by the MC is one that is warranted by virtue of it being decent and not well formed. The kid is young, brash, and not very intelligent, but his moral compass is spot on even if he is not good at expressing his reasons for despising the villain. Anyways, since I'm doing a review, might as well cover as many bases as I can think of? The animation is incredible. There is a surprisingly nuanced gradient across all of the characters when it comes to their morality and motivations. I have not read the manga, so it is difficult to distinguish filler, but there were a few episodes where I feel there were: unnecessary flashbacks, low animation budget/detail (I saw a guy hammering nothing at one point). The MC does seem a bit dumb and reckless sometimes, but he's a kid, so I like to think that the recklessness comes from eagerness to prove himself, and the dumbness on his age and lack of experience (Also perhaps I like to believe that around Doc he plays dumb on purpose, to tease him in front of the woman he likes). Also, I think people forget what it's like to be that age, and instead put on their old person hats when judging Shounen MCs. While the anime is not perfect by any means, I believe it has great potential. But yayyy review rants. Little skeptical at first but highly enjoyable after. Well first of i was a little skeptical about this and the first few episodes i was starting to give up on the anime but if you grin the first few episodes the anime actually is very much enjoyable the story at first was a bit dragging on my opinion. The main character is funny and he has a very interesting background lots of mysteries about his past, the anime it self is funny and the more episodes you go through the anime is beginning to go even more interesting, the animation is very good and the soundtracks aswell and the story line is super interesting and exicting cant wait to see this animes full potential when people become to realize how good this anime actually is, the anime is like mixing One Piece and Fairy Tail. I very much enjoy this anime and highly reccomend it to anybody else. So yeah, just like the manga if you ignore the fillers episode is AMAZING. Not just it feels epic and dreaming with season 2, you will want to know more plot and you'll read the manga. In my opinion, the characters are really good and the music is incredible I can't wait for the release of the soundtracks. No reason to go on and on about this one. Putting it simply; it is a complete bastardization of the manga and is absolutely not worth anyone's time. Read the manga for the good version of this story and of these characters. The anime tells the story poorly; it is mostly filler BS that just makes things drag on entirely more mundanely and boringly than the manga by leaps and bounds. The characters aren't accurate in many cases to the manga versions of them, and arguably the manga's proper versions of their personalities and actions are far more entertaining, engaging, and/or interesting. This is probably something they trying to push out but didn't really put that much effort into it. It is not bad but not good at the same time. It brings nothing new to the table only reusing the path that other popular main stream Fantasy Shounen had layout. Is a 5/10 and a 2.5 for creativity at most. I was a bit excited about this show based on how it started. There's a world with magic, but those who are able to use are seen as monsters, for they survived and encounter with humanity's main nemesis. The protagonist has a very clearly defined goal: to find Radiant, the place where these odd creatures come from, in order to destroy it and prevent nemesis from invading and destroying humankind. Even after seeing first-hand how normal humans mistreat Seth (the protagonist) and Alba (his mentor and mother-figure), we get an even more heart-wrenching moment on the third episode in Alba's flashback as we see young Seth being beaten and almost killed by humans who saw him as a monster simply because he has horns and can do magic. That episode really made me feel for these characters, and it was impressing that Seth was a good person who, despite all that he has suffered at the hands of normal people, still wants to protect them. By contrast, we see in the second episode that there are magicians who do not have the same outlook as Seth and Alba, and who want to take advantage on normal humans, as well as seek revenge. That duality really made the world of Radiant more relatable and interesting. Alas, that is where it all stopped. After the third episode the show took a deep dive into nonsense. Seth meets members of the Inquisition, who appear to be the antagonists who pursue and seek to eliminate sorcerers. "Why?" you ask. The so far (episode 6) the show's answer is "just because." There isn't a concrete reason for the Inquisition to hunt down sorcerers indiscriminately. It would make sense if they only went after wrong-doers. However, they arrest the naive Seth who could not control his broom and "crashed" into the Inquisition's ship. They had arrested Melie (the red-haired witch) because she did not have her documents with her. And I believe they were going to arrest Doc because he was carrying the remainders of a Nemesis. In the first couple of episodes the show clearly sets that sorcerers are the only ones who fight the Nemesis. Not once did the show state that the Inquisition does likewise, only that it is out to get sorcerers for no reason. That is simply not a good way of building up the world. Having a villain with no real motive is boring. Sure, the Nemesis are monsters that destroy everything in their way, but, so far, they seem to be mindless creatures. The Inquisition, however, only seems to be out to get all sorcerers, despite the fact that they are the only ones able to protect humanity from the Nemesis. Also, from the fourth episode forward everyone becomes incredibly one-dimensional and over-the-top idiotic. Those in the Inquisition boat seem incompetent of handling two young magicians and a goofy human. Then they arrive at the flying wizard mecca of Artemis Academy, which Doc forces Seth to become a citizen, knowing fully-well that that will cause Seth to be in enormous debt, which will be transferred to Doc as he had already gone through that process with Melie. Sure, it was very interesting when the cat leader of Artemis brought out the city's defense against the Inquisition, but that's about it. Everything in that town is incredibly goofy for its own sake. Melie, Seth, and Doc all become extravagantly wacky, boisterous, and unbearable to watch. At the end of episode six, Yaga, whom Alma sent Seth to encounter, decides to take Seth as a pupil, for we know that he is special. It seems like the show may or may not get better, but so far it has been incredibly disappointing, especially after such a great set up. This is one of the better new shows I've watched lately, it has a good story, excellent animation, the only thing I mind is, there isn't enough character development. The show is only 16 episodes deep so we might see a change therefore its 5 stars from me! This show is good. Interestingly enough, the writer of the manga is French - and if you think about it, there is plenty of European historical inspiration laced throughout the series. The character of "Seth" has been changed a little from the manga at least in the beginning, because in the manga he loathes competition and doesn't have as much of a Naruto-esque "gotta be the best!" attitude. 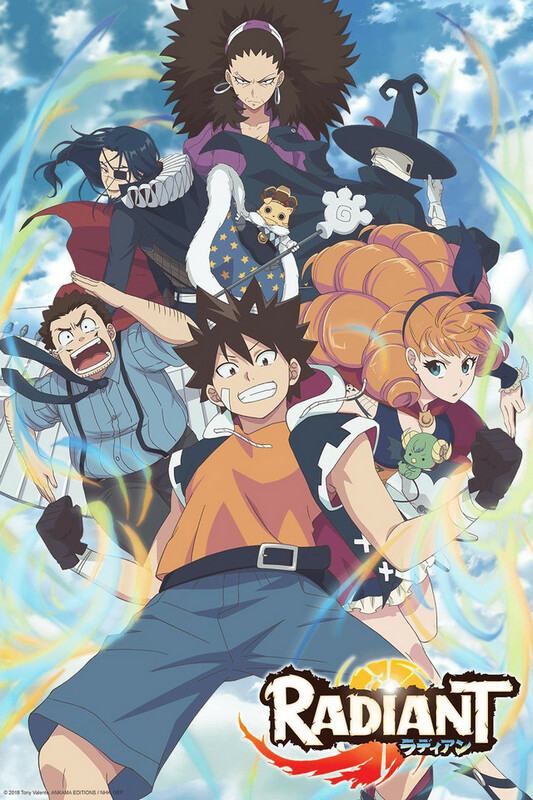 Overall, if you enjoy shonen anime - I think Radiant is absolutely worth your time. It is much better than the more popular and somewhat similar show "Black Clover". While Black Clover is ultimately boiled down to yet ANOTHER "kid who never gives up" - Radiant has much deeper philosophical themes, some of which are pretty timely. The show has more of a sense of foreboding and the characters are more complicated. The anime definitely toned down the source material for a younger audience and even cut out key events that are instrumental to telling the story. It isn't terrible but the manga is quite good and this is mediocre at best. If you enjoyed this even a little do yourself a massive favor and read the manga it is well worth the time. If you hated this the manga still might appeal to you but if you just read the manga and are considering watching the anime just be warned this won't live up to the source material.